The spell checker on the computer was not able to figure this out so we asked Mom to translate. HINT: you can find the answer in my column in this week’s Lahaina News out tomorrow. The quote can you read kindergarden comes straight from the lips of our precocious grandson who writes a journal along with this fellow students. My daughter has visited here some 30 years since she was six months old. The grandson: his third time at age six. 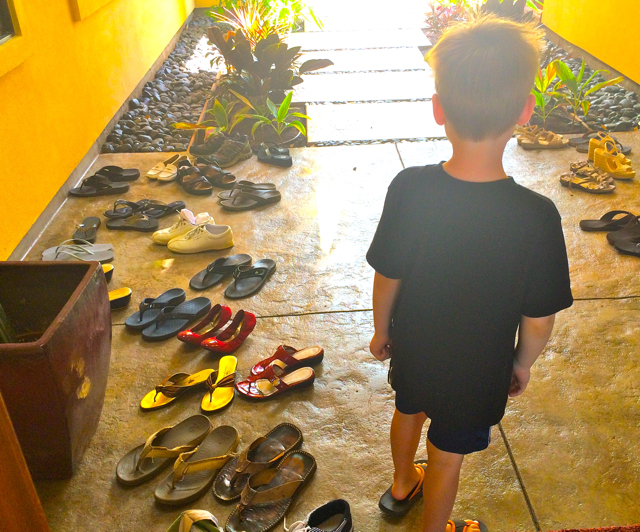 The grandson also reported that the party staged by our Rotary Club of Lahaina Sunset was “awesome.” No telling what this quotable guy is going todo when he grows up after drinking smoothies andf galavanting about for two weeks. As you can see, my beautiful daughter got her looks not from me but my wife of 44 years. Beauty runs in the family..at least on the wife’s side. Previous What is the most colorful place on Kaanapali Beach Today? Next Everybody into the pool on Easter on Maui.